Hi readers new and regular, it’s taken all day to compose myself I do not wish to lose my best friend it’s that simple ! Wiggles had her check up yesterday, we took her back after I noticed a lump, she was on bedrest with social interactions before hand hoping there would be some change. We were not expecting the news that wiggles may have bone cancer in her shoulder we thought at most she may of dislocated it whilst un watched but the vet used a needle to check for puss there was none, our world feels like it’s crashing down around us with Debbies parents illnesses we were not expecting this at all. BPD or borderline personality disorder is what I fear second to losing wiggles I tried to go when my last dog did I’m not sure if it’s my disorder or I just prefer dogs to most humans and feel suicidal when this happens I do not wish to lose my best friend no one does. I had a full blown panic attack at the vets the combination of the news seeing blood and not being able to control my emotions set me off, I was left to compose myself before we booked wiggles in for next Tuesday the anaesthetic is risky at her age but it’s needed to get a look at the shoulder. The vet did give us options and scenarios depending on the X Ray results but I cannot remember he’s face now let alone what he told us (so glad my wife was there) to listen and write down what was needed, I cannot handle places of high empathy it’s why I’m trying to help Brighton’s homeless this year as it’s a trigger to those with BPD or even just high empathy or nice folk. I live on one of Brighton’s most famous streets and I know less than two hundred yards away three or four homeless people will now (12-49am) either asleep or defending themselves from drunken idiots just like that fool in the news just lately. 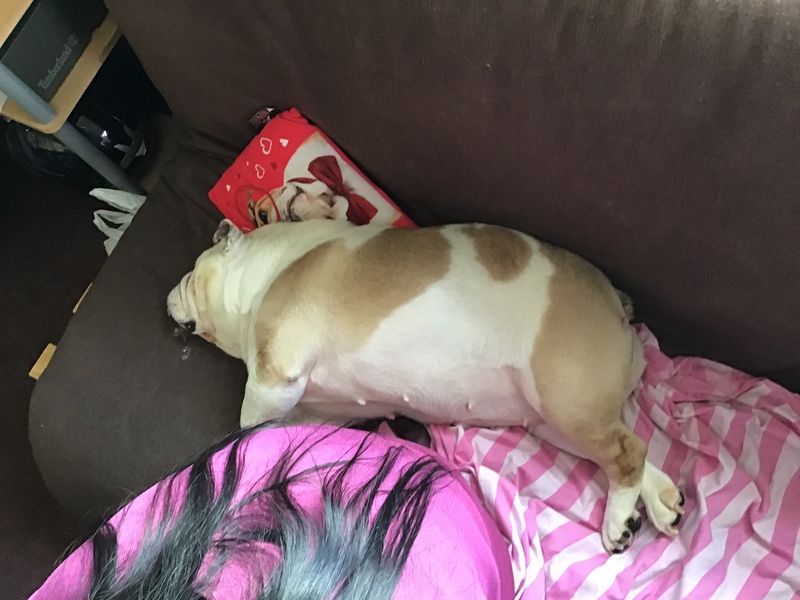 anyway let’s get back to I do not wish to lose my best friend, wiggles is now on tramodol for any high density pain and antibiotics to try and help with any swelling, until next Tuesday Wiggles will get treated like a queen  I’ve already boosted her chow with fresh meat  (cooked) fish  and veggies too. Less time on social media and more time with wiggles (I was not to know) and if we were truthful wiggles did take to debs on arrival and has gone for my face on three occasions with me being very lucky  indeed yet I’m the tech geek so created wiggles into a social media minor celeb. I wont lie writing I do not wish to lose my best friend ✍️ has bought a few tears  but I know she’s loved across the world  and all those that show real love for a bulldog theve never met whom cannot talk but has made such a stamp on people’s hearts ♥️ Collectibulldogs on twitter was dismal I put wiggles up and within 3 three yrs I went from 256 followers to a whooping 209k and still growing. My CPN is on high alert  for next week I’m honest about my illness so in saying that my wife has taken all sharps away all my medicines and even asked someone to take my tool box, if it’s bad news there’s a small chance of inpatient admission I’m hoping to have more self control say this and still end up going down hill. It’s a week away so I’m going to spend some quality time with Wiggles I have had a reverse sleep issue just lately but I’ll happily stay awake for a few days watching her helping and supporting her from eating to number ones and number twos. im just glad I got to adopt such a beautiful loving creature whom came with issues that we’ve overcome this time age Is not on her side even thoughts of a three legged wiggles is far from my thoughts please send love prayers (not money) and any kind of hope I’m of the OCD magical thinking type so believe in more things than you may think. Surely theres enough love  out there that if channeled this way could do good or am I living in my own world again, I have the funds now to complete my test and get on the road I was asked by both my wife and CPN to put this on hold until we know what’s what and when we do I’ll let you all know. 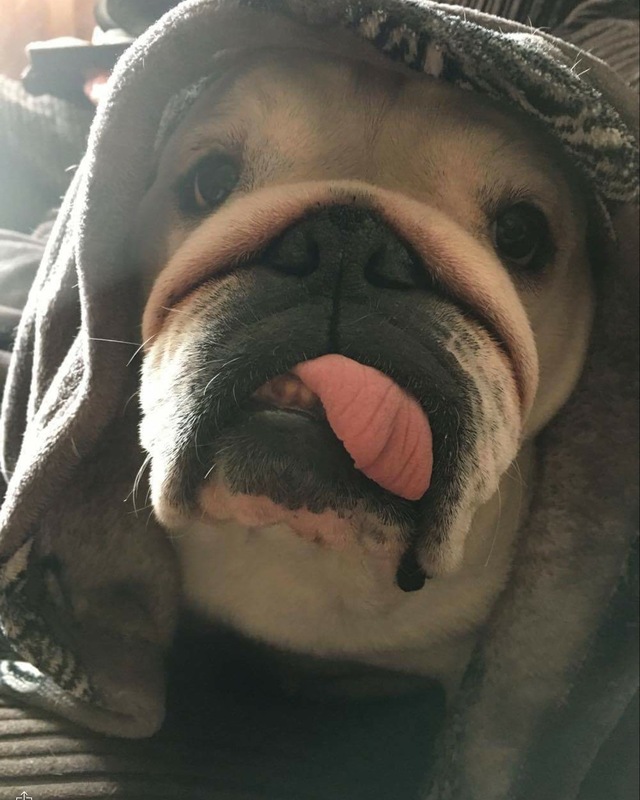 THANK YOU TO ALL THAT BECOME A PART OF WIGGLES LIFE Check it out Twitter loves Wiggles is just one article showing the ❤️❤️❤️❤️❤️❤️ For this super cute bulldog. Sending love and positive thoughts to Wiggles and all the hope that she will be better soon. I’m so sorry to hear that Wiggles is not well, but I tha k you for sharing your story and struggles as well. Pain, grief, mental health isn’t always talked about. As many people dont k ow how to describe their own experiences or are unsure of how to deL with those that do. I’ve lost most friends since my husband passed away. He was my best friend and my world. Yes, friends keep in touch via text or Facebook, but my life is a lonely shadow of what it once was, or what I hoped it would be. Wiggled needs you. The world needs you to keep sharing your story. Even if you (like me) prefer the company of animals over people, there are many y people who can help you, and be helped by you and your words. You’re family is in my deepest prayers. Please hold on,. We will never meet our possible best days ahead if we decide there will be no hope in seeing them. Take care of yourself, and know your matter. Hi there Please note I found this comment quite poignant it took me awhile to think of how best to respond, other than my friend or maybe a stray comment we do not usually get any viewer participation, I’m happy to be honest and open about my mental disorder If the website was to get more exposure I would have a page dedicated to the helping and talking of mental illness but there’s not enough views to make it worth my while at the moment. BPD is a self destructive disorder so I’m rather worried right now and not looking forward to making decisions regarding wiggles next week she’s become a little star I’ll be lost without her or worse. Let’s see. Sending love and positive thought to Wiggles. I hope that she will get better and that all will be well.